These are lyrics by Bob Dylan that we think are kind of repetitive. 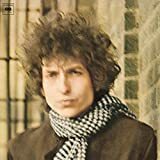 Bob Dylan's, "All The Tired Horses"
How'm I 'sposed to get any riding done? Those are the entire lyrics of the song, repeated over and over throughout this three minute and eleven second song.